Manillas are cast, horseshoe-like crescents of metal with flared ends, usually made of copper, bronze, or brass. In the same way that coins were used in Europe, these metal objects were a medium of exchange in most areas of sub-Saharan Africa. Traded in local markets or sent far afield, they had an exchange value but were also treated as ingots that could be turned into things suited to the needs of the local population. By the mid-1400s, the Portuguese were manufacturing manillas at home for their merchants to trade for commodities such as elephant tusks, gold, pepper, and captive people in Africa. 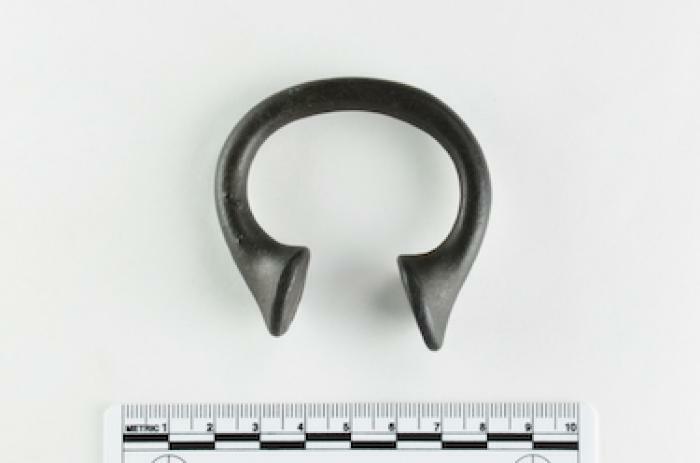 The word “manilla” is thought to be a variant of the Portuguese “manilha,” which means bracelet or U-shaped shackle, though the Africans had their own, local names for them and never used the term. During the eighteenth century, as other European nations entered the slave trade, the fabrication and use of manillas began to spread beyond Portugal. England in particular became a leading center of production for the simple metal pieces; the city of Birmingham became the focal point of the industry and home to several manilla manufacturers. Even though the transatlantic slave trade ended in the early part of the nineteenth century, manillas continued to be an important trade commodity for Europeans doing business in Africa, and through the 1800’s they were exported in vast quantities to trade for African palm oil. It was only in the early part of the 1900’s that colonial European governments, in a desire to bring order and uniformity to mediums of exchange, began to discourage the use of manillas. The English outlawed their use in colonial Nigeria in 1949, bringing an end to a 500-year old tradition in favor of standardized coinage and paper money.